We are very excited to be hosting our Sixth Annual THANKSGIVING DINNER at Jaynes. This is one of the most special days of the year here and Jaynes will be serving a prix fixe Traditional Roast Turkey Dinner with all the trimmings. 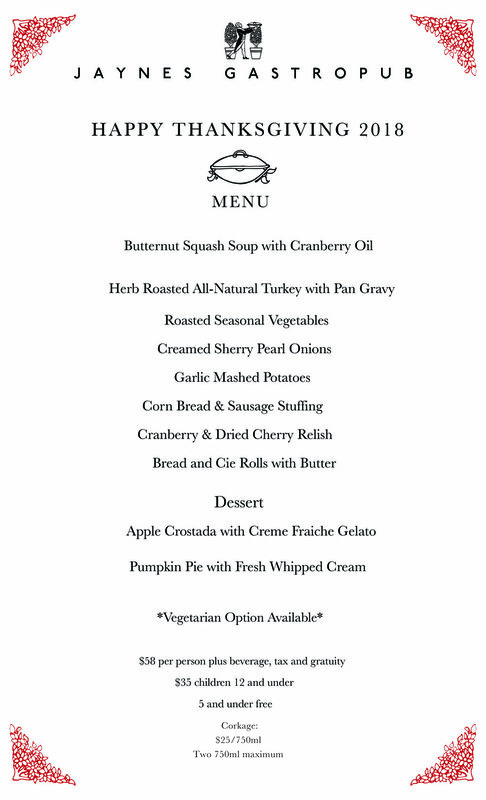 Dinner will be served in 3 courses starting with an appetizer course followed by a generous roast turkey main event and of course dessert! Vegetarian options will also be available. Reservations will be accepted for times between 2pm and 6:30pm. Dinner is $58 for adults, $35 for children 12 and under and the wee ones, 5 and under, are free! You may view the menu below. You can make your reservation online here. Please feel free to call the restaurant at (619)563-1011 if your table size or time is not available. We will do our best to accommodate you. Jayne, Jon and family will be here and hope to spend this very festive day with you! Join us at Jaynes for our annual New Year's Eve Feast! We will be serving a grand feast to ring in the New Year and 11 years around the sun here at 30th and Adams. There will be a 3 course prix fixe menu for $85/pp. You can make online reservations here. We are very excited to be hosting our Fifth Annual THANKSGIVING DINNER at Jaynes. This is one of the most special days of the year here and Jaynes will be serving a prix fixe Traditional Roast Turkey Dinner with all the trimmings. 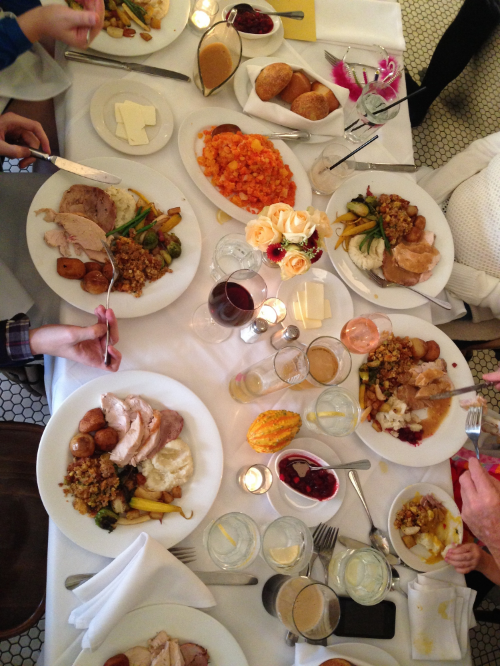 Dinner will be served in 3 courses starting with an appetizer course followed by a generous roast turkey main event and of course dessert! Vegetarian options will also be available. Reservations will be accepted for times between 2pm and 7pm. Dinner is $55 for adults, $35 for children 12 and under and the wee ones, 5 and under, are free! You can make your reservation here. Please feel free to call the restaurant at (619)563-1011 if your table size or time is not available. We will do our best to accommodate you. Come join us at Jaynes for a special Easter Brunch this Sunday April 16th. Our full brunch menu will feature a proper Full English Breakfast. No skimping here, breakfast includes two eggs, English Heinz beans, Irish rasher bacon, pork sausage, black pudding, grilled tomatoes, mushrooms and fried toast. We will also be offering delicious Brioche French Toast with fresh berries and cream with real maple syrup in addition to many other menu options. Sounds like a perfect afternoon to enjoy fresh blood orange mimosas, a Pimm's cup, Rose' or maybe a classic Bloody Mary! Reservations are highly recommended, but walk-in guests are very welcome. Reservations between 10am and 1:30pm. If you have a large party and the online system doesn't find a table, please call us at 619.563.1011 and we may be able to figure something out. Thanks for your patience while we took our 10th (!) annual holiday break. This break is a key ingredient in the Jaynes recipe and we return refreshed and eager to share another year with you here at 30th and Adams. We will see you soon! Thank you for making this such a wonderfully busy and festive holiday season. This was our 10th season here at Jaynes and we thank you for all of your constant love and support. Each year we close for a staff holiday right after NYE. This year we are closed from January 1-11. We reopen Thursday 1/12/17 at 5pm. For now we wish you adieu and a successful, happy 2017! New Years Eve 2016, 10th Anniversary Edition. We will be serving a grand feast to ring in the New Year and 10 years around the sun here at 30th and Adams. There will be a 3 course prix fixe menu for $85/pp. There will be a Champagne toast and music by DJ Greyboy to ring in 2017! Online reservations are required and are available here.